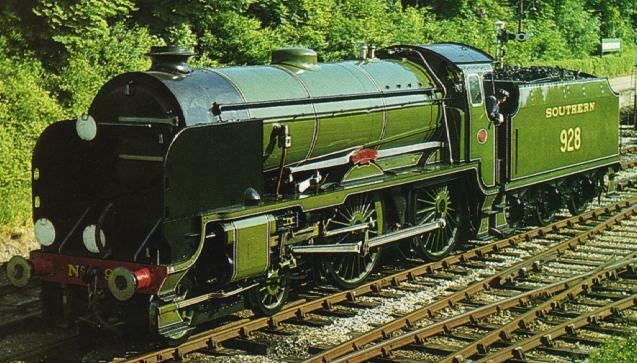 Southern Railway Schools-class No.928 "Stowe"
The final development of the classic express 4-4-0, the V-class or "Schools" are believed to be the most powerful engines ever built of the 4-4-0 arrangement. These three-cylinder engines were designed originally for the Hastings line, with its restricted loading gauge and short turntable at St. Leonards. However they proved themselves capable of hauling the Southern's top expresses, alongside larger engines, on the railway's other main lines. "Stowe" was one of a batch built for the London-Portsmouth run. Following the electrification of this line in 1937 many were transferred to Bournemouth shed, where they were used both on express trains into London Waterloo and with lighter portions of through trains going further west. Cecil J. Allen reported in 1939 on a run with this particular locomotive from Dorchester to Wareham, recording 95mph near Wool - a speed believed to be a record for the class. Bought from British Railways by Lord Montague, "Stowe" was for a time displayed at his motor museum at Beaulieu, in the company of Pullman Car Fingall, before moving first to the East Somerset Railway in 1973 and then the Bluebell in 1980 where it was rapidly restored to working order. Having hauled its share of trains for the duration of its boiler certificate, it is now stored awaiting its turn in the workshop. In September 2000 no.928 was bought from Lord Montague by the Maunsell Locomotive Society, thus securing its future on the Bluebell. As a start to the loco's overhaul the society's restoration team have taken on the complete rebuilding of the tender, which has received new dragboxes and a new tender body. Original number and name: 928 "Stowe"
Cylinders: (3) 16.5" x 26"
Current status: Static display, awaiting overhaul. For further information go to the Maunsell Locomotive Society's web page for this engine. Last update 6 April 2009 by Jon Elphick. © Copyright, disclaimer and credits.